Discover an innovative way of weld cleaning, as well as marking, polishing and etching with Cougartron. A company with a forward-thinking approach and a passion for developing cutting edge technology, Cougartron have become the industry experts for stainless steel weld cleaning and marking solutions. If you’ve ever tried to clean weld, you’ll appreciate what a tough job it is, making industrial workshops an even more hazardous environment. Cougartron identified the problems straight away and set out to develop a range of products to combat the issue. Before Cougartron came along with its weld cleaning and marking machines, cleaning was a long and arduous process which relied on harmful chemicals. This was high risk to the welders and damaging to the environment so Cougartron set out to create a better solution. 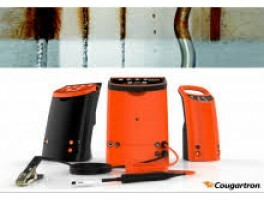 After identifying the problem, Cougartron developed a range of weld cleaning machines and associated products. This allows stainless steel and aluminium weld to be cleaned safely and easily for the first time. Regardless of whether you’re dealing with a MIG or a TIG weld, the Cougartron weld cleaning machine can handle it, efficiently and easily. Despite developing a standout product which has revolutionised the market, Cougartron continue to seek to push new boundaries and create new technology. Their research and development team utilises the best of scientific knowledge to find ways to make weld cleaning more economical, safer and environmentally friendly. And what’s even better is that their technology comes with one of the best warranties you’ll find, guaranteeing you a prompt and rapid service, should you ever need it. To find out more about how Cougartron could change the way you work, get in touch with us today!